It’s not all just standing up and talking. Some shows at the Edinburgh Festival Fringe have multiple people standing up and talking. And moving around. Here’s our recommendations for the best sketch groups to see at the Fringe in 2012. Jigsaw provide fast, slick and polished sketches which always end in a satisfying punch line. Nat Luurtsema, Dan Antopolski and Tom Craine are superb comic actors, elegantly switching characters in an instant. Time flies when you’re having fun and Getting Jiggy goes by in an instant. Or an hour if you’re talking facts. Sheeps are by far and away one of the most interesting and unique sketch groups around. Fans include Time Out, London Is Funny, Daniel Kitson and… us. Last year’s show included members of ABBA and the Bee Gees visiting and old lady to steal her songs. Pretty odd sounding isn’t it? It is. And it’s brilliant. Consistently well written and delivered sketches have brought Casual Violence a string of 5 and 4 star reviews over the previous Fringes. Sketches can touch on darker subject matter like murder and death but Casual Violence never gets bogged down in the nightmare and always building to a satisfying twist. A sketch group of exceptional talent. Edinburgh Fringe legends Pappy’s latest show is called “Last Show Ever!”, and I really hope it isn’t. The trio’s gift for daftness is unlike anyone else’s and the long established chemistry between Matthew, Tom and Ben is a joy to behold. The usual mix of silliness, daft props and songs is all here. Catch them while you can. You may not get another chance. 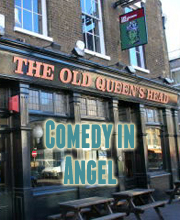 Sad Faces previewed at Laugh Out London in July, and it was one of the best shows we had. Sketches are all tied into the story of one day told from the different face’s perspectives, all kicked off by a green porcelain rabbit. They are definitely one of the most instantly likable acts you will see and the sketches blend well into the narrative, not to mention its bloody funny and brilliantly performed. I’ve seen the Beta Males at the Edinburgh fringe every year since 2009. And this year will be no different. Masters of sketch storytelling, in previous Edinburgh’s the Betas have been trapped in a post-apocalyptic bunker, averted disaster on a train and now blast off into space. Consistently one of our favourite acts at the fringe, and for very good reason. Max and Ivan will want to build on last year’s Fringe after winning the Panel Prize for their rather spectacular one off special “The Wrestling”, but Con Artist might see them heading for more awards nods. The duo’s performance is fast paced and slick with a massive array of characters using all archetypes from heist movies they can. It’s a seriously impressive feat, and hugely entertaining. One of the most striking things about Steve and Sam is the chemistry that the two hold between them. The banter between the sketches ties the act together in-between sharp set pieces. They have been compared to the likes of Eric and Ernie, Vic and Bob and the Boosh for good reason – there’s two of them and they’re men and they’re funny and charismatic. Checkley and Bush’s Comedy Riot! Checkley and Bush’s sketches are loud, surreal and joyous. They really know how to bring energy and life into a room. Two genuinely funny comic actors with well-crafted material, who are not afraid of a musical number or two. One of them was on Bad Girls too, so that’s exciting. I think. I’ve never seen Bad Girls. Expect a trip into a dream world of surrealist thought, dissonant sound and nice jumpers. Oyster Eyes are not your usual sketch group. They are unusually good, however.